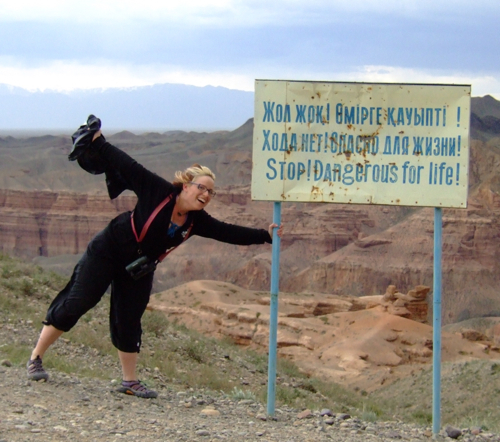 Charyn Canyon, Kazakhstan Winds Dangerous For Life! 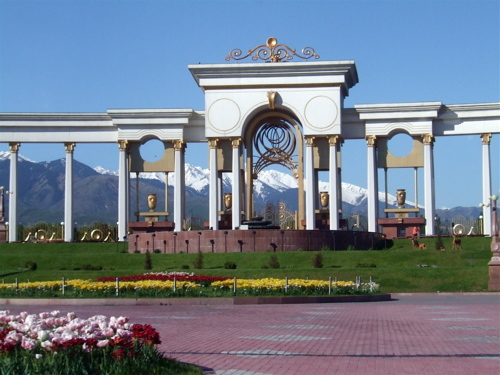 I found another Kazakhstan entry from when I was there last May! Whoot! 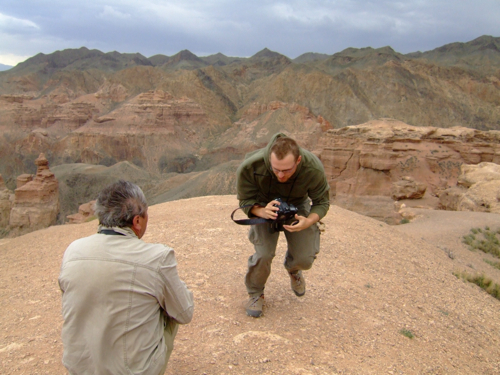 One of the coolest places that Swarovski took us to test out their new magnesium scopes was Charyn Canyon in Kazakhstan. It's so huge that you can barely see the people in the distance in the above photo. 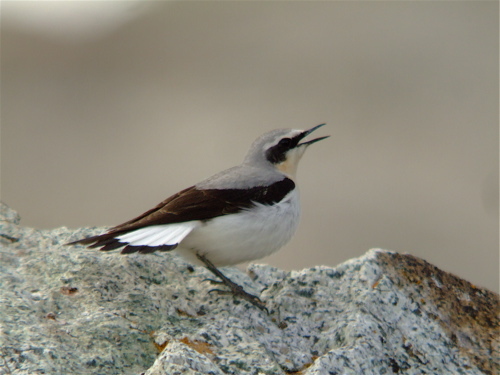 I think the only bird we got here was the alpine swift because we were so overwhelmed by the breathtaking views...and the dangerous winds. 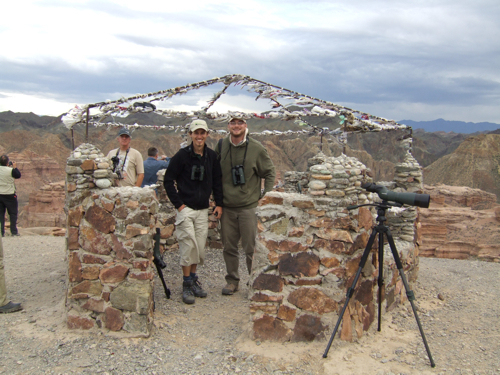 We had been birding other areas and we were fortunate that for the most of our trip we avoided rain. 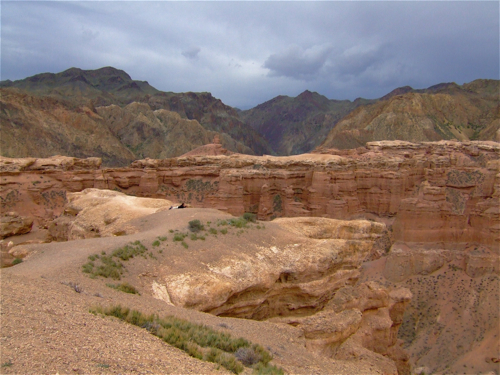 But a storm was coming and our van driver was doing his best to get us to the canyon before the storm hit. The dark clouds swallowed the huge mountains as it caught up to our van. We made it to the canyon with the storm still at bay. We had to check in at the ranger station...wow, I feel like some of my local parks are neglected when it comes to funding, but all this ranger had was a trailer. That's our guide Sergei entering to make sure our bus could pull through. I think the ranger was just excited to see people. 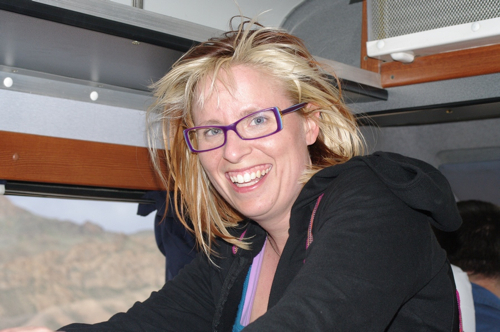 Our bus took the narrow gravel roads as high as it could and we were let out to take in the view. Above is Dale from Discovering Alpine Birds and Corey Finger of 10,000 Birds (and my buddy Clay Taylor is lurking behind them). I think this was a little prayer sanctuary right above the canyon. Knowing that we had limited time before the storm hit, we left all of our scopes there to take a few moments to explore the trails. The canyon was like a mini version of the Grand Canyon, but no less spectacular. The locals refer to it as "Dolina Zomkov" which translates to "Valley of Castles" and it's easy to see where that folk name came from. Even with the approaching clouds, the color of the rocks were a lovely palette. 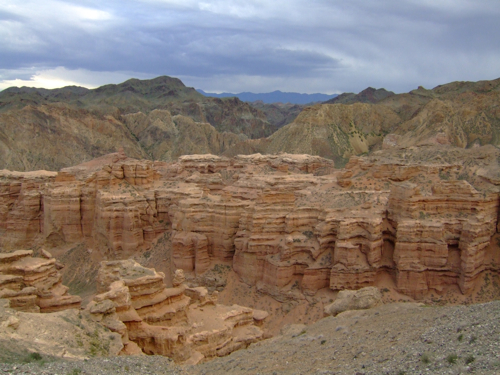 The canyon was formed over over centuries with the Charyn River, a large river that runs through the Tien Shan Mountains. In a short amount of time, we had managed to work our way down the trails and the wind hit and it hit hard. As I took this photo, a fellow traveler who was much taller than me was literally knocked over by the wind. He wisely hightailed it back towards the vehicle. My low center of gravity kept me fairly upright and I explored a bit further down the trails. I could see Dale off in the distance. His defense to get the perfect photo was to lay flat on the ground, which is close to the position he remained in on his way back up the trail. 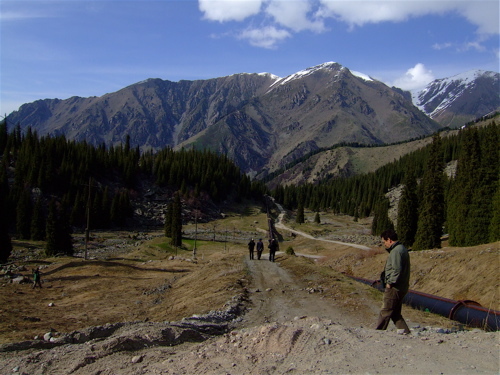 Here's Corey and Sergei working their way back up the trail. The wind eventually was so strong that I crouched too. It was simultaneously exhilarating and scary. We would crouch and work our way up, then periodically hold on to one of the larger boulders when the wind would gust harder. If I stood straight up, I could feel my body being moved as my shoes slid over the loose gravel. Getting knocked over by an invisible force larger than myself and plummeting to the canyon below became a real possibility. While we were down the trail, we had left our magnesium scopes up at the top--the wind blew them all over. 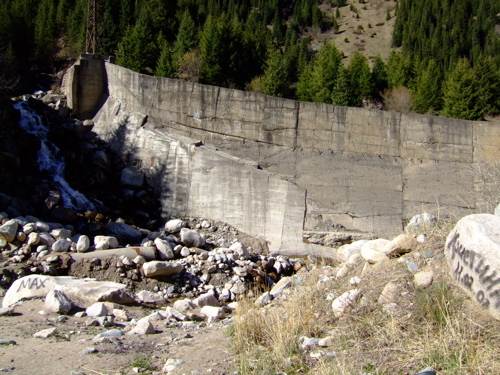 Fortunately, Swarovski scopes can take a beating, so they all survived, but Clay and some of the others gathered the scopes and loaded them into the van so they would blow over the side of the canyon. 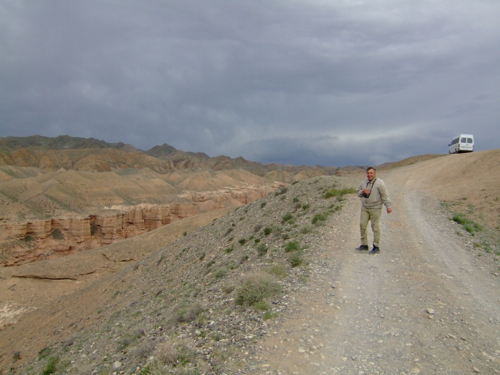 I have to say that up until this point, our guide Sergei had been a very serious man. As soon as the wind hit, he laughed and howled like a wild man, it energized him like a thousand cups of coffee. This sign wasn't kidding, this canyon is Dangerous for life when the wind hits. Dale put up a YouTube video of his shots that he got when the wind first hit. There's also a bit of me demonstrating what it was like to walk to walk in that wind. My hair that morning started out wavy and ended up stick straight after that wind. All in all, one of the highlights of the trip even though we didn't see much in the way of birds. 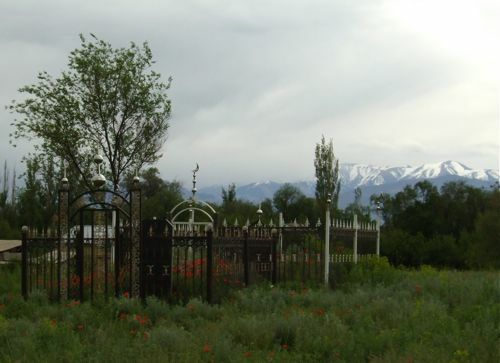 You may recall that I took a little trip to Kazahstan in May...I still have a few posts left to write about this wonderful place. I don't know if I will ever get back, but I hope I do. I have said it before and I will say it again, if you want to feel like the only person on the planet, you find several spots that will give you that impression. 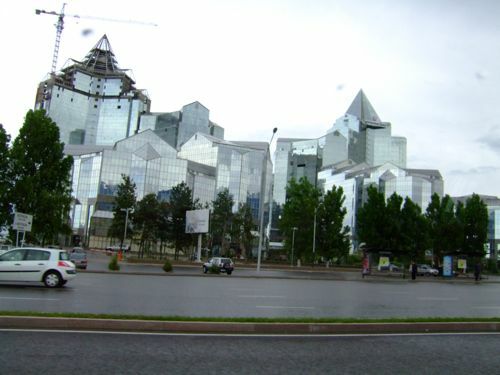 When we first arrived, we stay in Astana, a city still growing and full of new development. It's on the Steppes which is basically short grass prairie, but the locals do try to grow trees and they are very small. 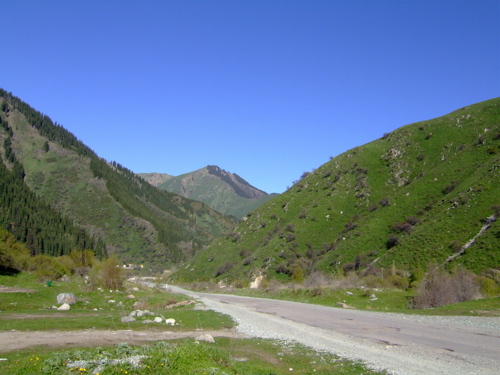 Above is a photo of Almaty, and older city with established trees and older buildings. I was most curious about my accomodations at this hotel, in my travel itinerary it was described as a "Soviet Style Sanatorium." However, as you can see in the above photo, the rooms were not padded and did not come with complimentary straight jackets. They were very clean and simple. The tubs were huge and even though I was tired and had to get up early, I refuse to let an opportunity to soak in a deep hot bath pass and took advantage of it. I had a life bird singing the whole time right outside my room, a scops owl--kind of like an eastern screech-owl (here is what it sounds like). It was not what I would call a soothing and relaxing sound...neither were some of my fellow birders outside my room trying to call it in. I ended up putting on my headphones in order to fall asleep. 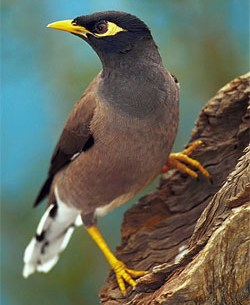 The next morning I woke up to some crazy birds outside--like Indian Mynahs. 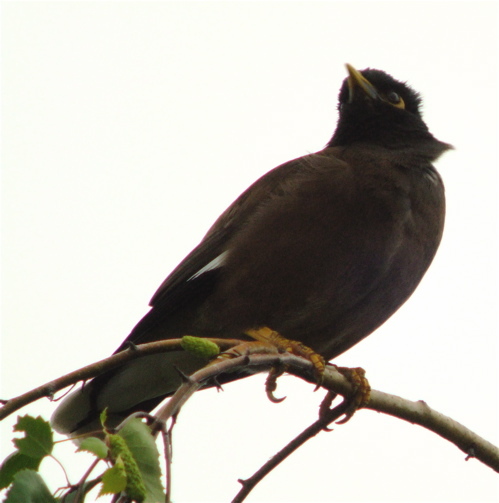 Alas, it was a tad cloudy and drizzly so I was not able to get the best photos, the mynahs were very striking birds. Here's a photo of what one looks like. 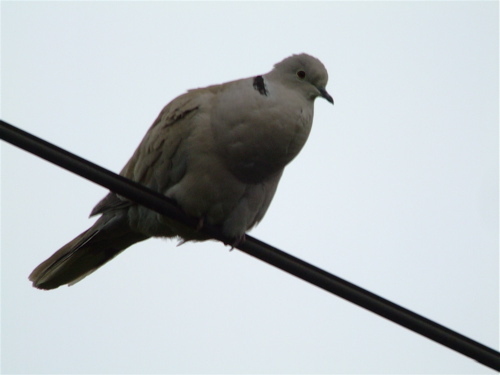 Here was a familiar bird--the Eurasion collared dove. A bird working its way into the United States as an introduced species. 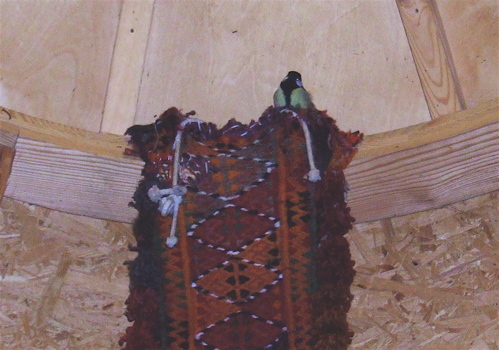 Again, here I was seeing the bird where it was supposed to be, Eurasia. Our breakfast at this hotel was an odd combination of cold cuts, white sausages, cucumbers and tomatoes, cheese, some kind of cabbage salad and yogurt. I was also getting accustomed to NestCafe--instant coffee granuals are not as bad as I thought. We had quite a few destinations this rainy day, but some of the most exciting were around this cemetery. Not quite as grand as some of the larger ones seen near Astana but still quite cool. This spot was where we got our first look at hoopoes which were just too darn fast digiscoping on a cloudy day, but man what a dynamite looking bird. And what a fun word to say. Incidentally, it is pronounced "who poo" not "who poe." We passed quite a few shrikes on the road and one was teed up in the cemetery. For a bird that is known to impale it's prey on spikes and sharp barbs, a cemetery seemed the perfect place for it to establish territory. Surrounding the cemetery were huge poppy fields. 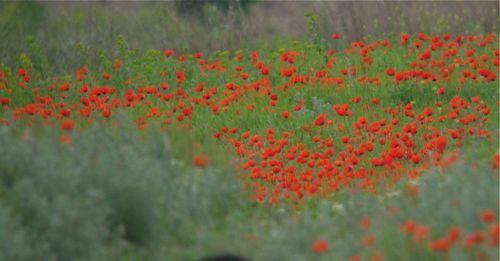 We passed dozens of fields with wide swathes of crimson, full of poppies. 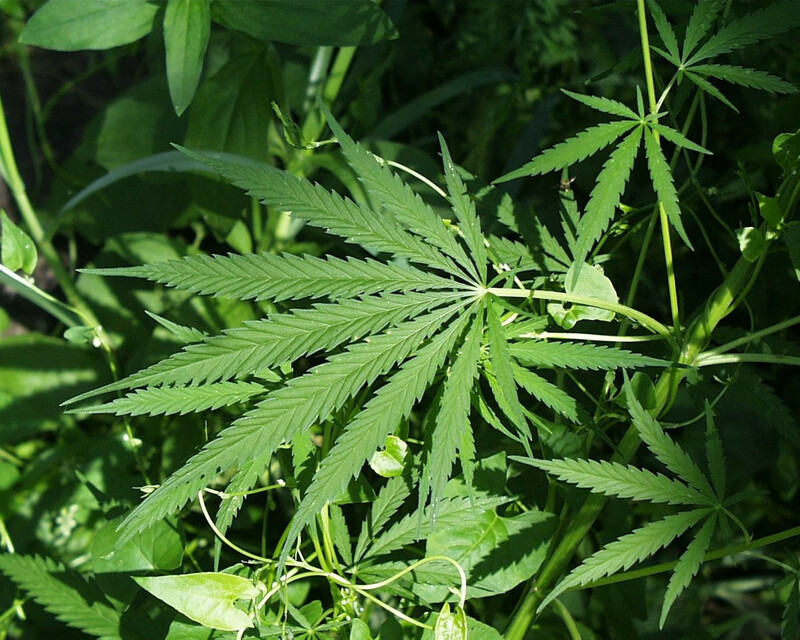 When we stopped near the cemetery, we did find an interesting, yet familiar plant growing among them which we all sensibly acknowledged but left behind with knowing smiles. 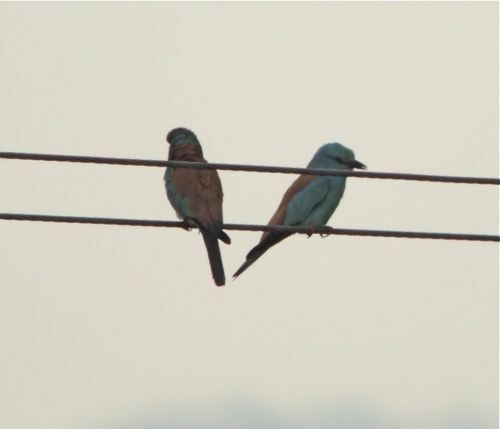 Another exciting species for me (but not as exciting for my fellow European birders in Kazakhstan) were these rollers. They are kind of related to kingfishers. They are a striking big blue bird and looked gorgeous over the poppy fields. 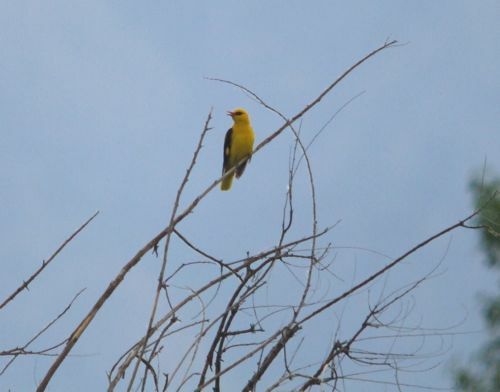 Another bird that showed up was the golden oriole. Again, these are just the tip of the iceberg to the amazing birds and scenery that were yet to come this day. 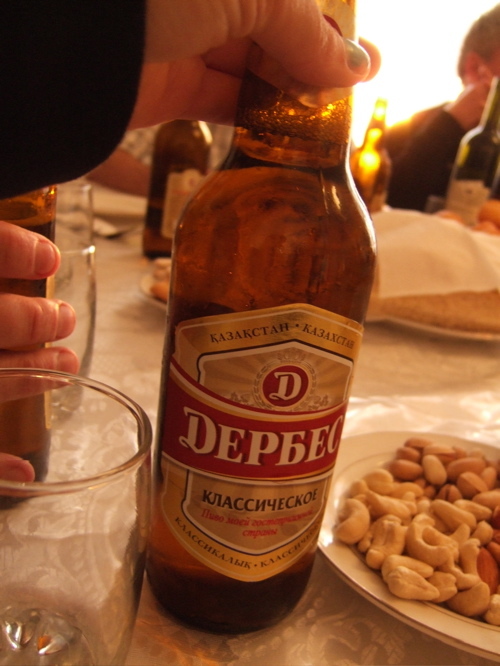 I've blogged quite a bit about the first part of my amazing trip to Kazakhstan. We spent the first half on the Steppes (short grass prairie) and then flew from Astana to Almaty. 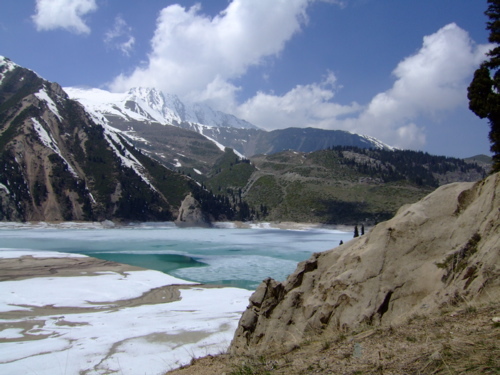 I think my favorite part of the trip was exploring the Tien Shan Mountains near Almaty--beautiful, remote, rugged. Everywhere you went, even in downtown Almaty (above) you felt that adventure was just around the corner. And for people who think birding is boring, I submit this photo. 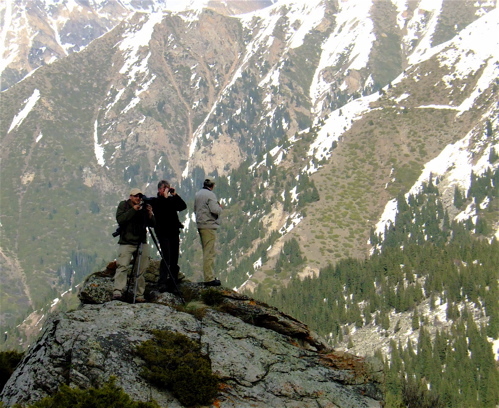 How can you see birders perched on on a peak surrounded by snow capped mountains in Kazakhstan and say that bird watching is boring? Especially with the types of birds we saw. Look at this little beauty. 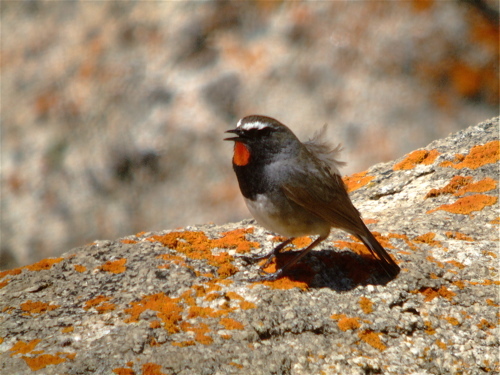 This is a Himalayan rubythroat singing on territory--I love that I saw birds with the word "Himalaya" mixed into their name. Some of the other birds our group saw on this glorious day included red-mantled rosefinch and fire-fronted serin. 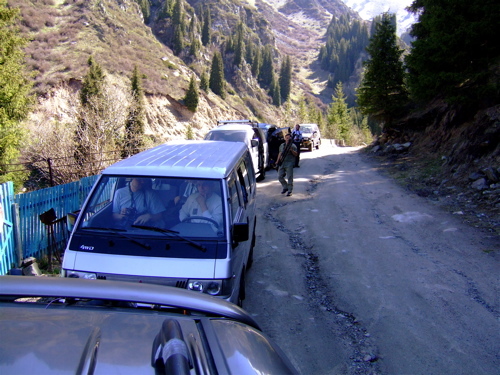 After an interesting breakfast of cold cuts, tomato cucumber salad, porridge, various breads, really white sausage, and Nescafe we loaded up into vans and took some very vertical and rutted dirt roads into the Tien Shan Mountains. 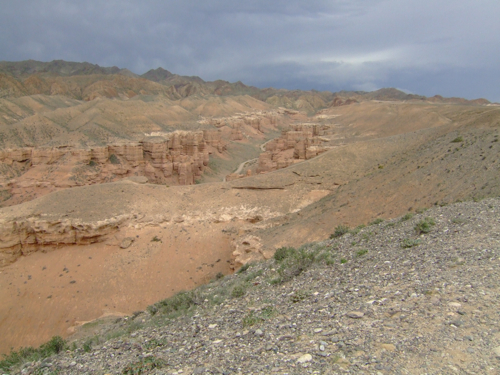 We were on our way to Ili Alatau National Park (follow the link to the park and take note of the wildlife species list). It was a warm May day outside our hotel but I noticed that the mountains in the distance had snow, so I wore my convertible pants, socks with my Keens, wore a fleece and kept a scarf around my neck. Everywhere we looked, we were surrounded by grandeur. 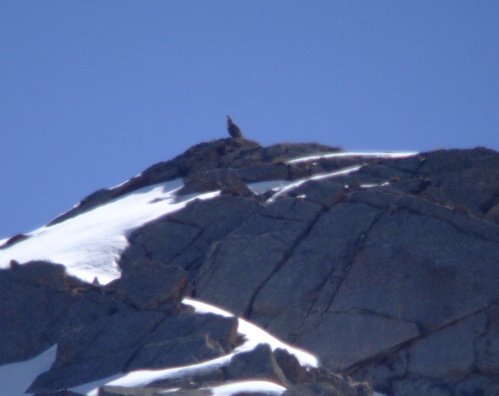 We made a few stops for soaring raptors and found black kites and a non raptor called a chough (pronounced "chuff"). 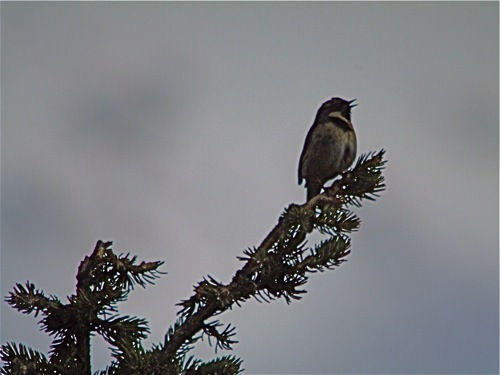 All kinds of smaller birds could be heard echoing from the mountains. We made a stop here for brown dipper. It was cumbersome getting a large group of eager digiscopers around the rocks, we were all impatient for this cool life bird and anxious to get a photo. I got a brief look and the bird flew round the bend. Some of the group followed, but I opted to stay in my spot. If this dipper was like the dippers in North America, it would be back. While I waited, a grey wagtail perched nearby. One of the British birders made a comment that I shouldn't be wasting time with that species, there were more exciting ones to be seen. Wagtails in all sorts of color variations are prevalent in Europe and since I hadn't been anywhere near Europe up to that point, it was very exciting to me. The group that followed the brown dipper got great looks at a mating display. 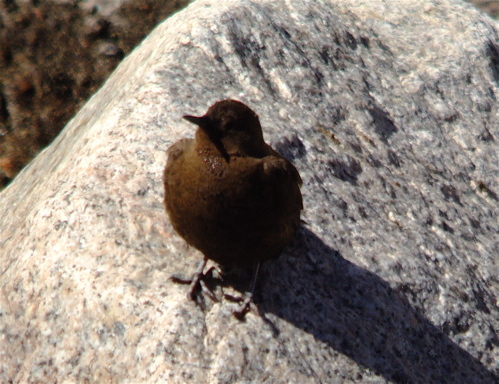 All of us ended up getting photos of this little brown bobbing bird. 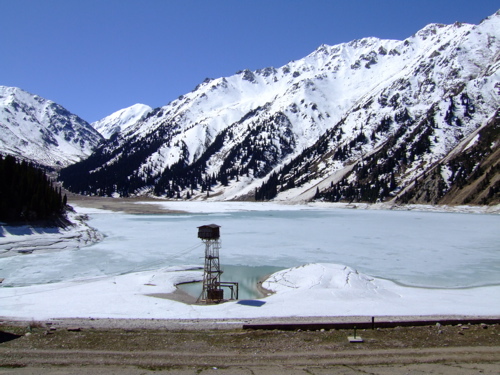 We eventually made to our destination--Big Almaty Lake. Our target bird was a shorebird called an ibisbill. The birds have nested in this area in the past. Alas, we did not see it on this trip, but who cares when you have scenery like that to take in? Despite all the snow and ice, it was perfect hiking weather. I even had to remove the fleece because I got so hot. There was a pair of common kestrels hunting over our heads (above is the male). That was not the only falcon--there was also a pair of Eurasian hobbys screaming and flying overhead--I was so excited to see those and they totally make up for the lack of ibisbill. I have always wanted to see a hobby ever since I was a kid and watched an episode of the Leo the Lion called The Falcons when an angry flock of hobby falcons get dropped off in Leo's jungle via a tornado and attack all the animals. While we were walking, we could hear Himalayan snowcocks calling all around us. They sound kind of like loons or perhaps a bit more like elk. 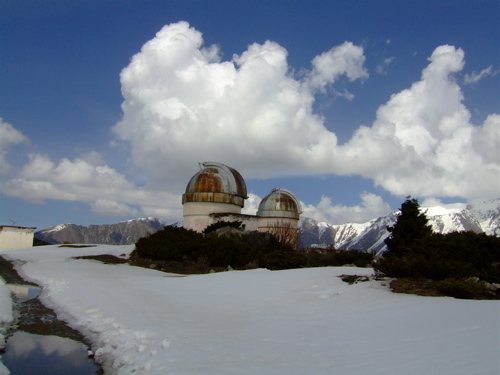 I scanned the tops of the mountains wondering where they were when Philippe Jacques Dubois (the dude in the above photo) actually found them with the scope! 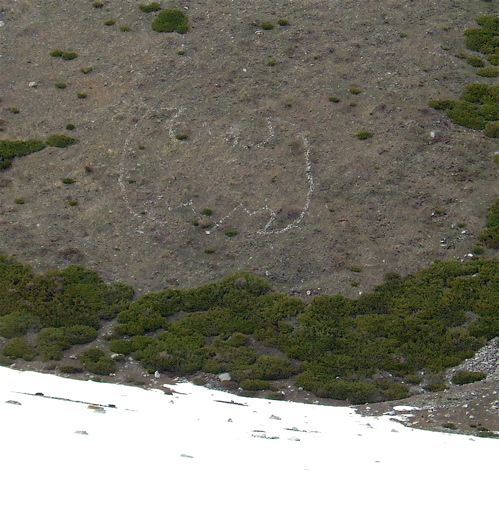 The arrow is pointing to roughly where the snowcock was standing and calling. And there is the snowcock and here is a link so you can what they look like close up. There was also a female who would pop up and down causing the male to go into full display mode--it was awesome. I was so excited to see these birds here in their native habitat. We actaully have a population of these birds in Nevada...a snowcock introduction program was started in the 1960s because Nevada felt there weren't enough native game birds to hunt, so why not bring in an Asian species? 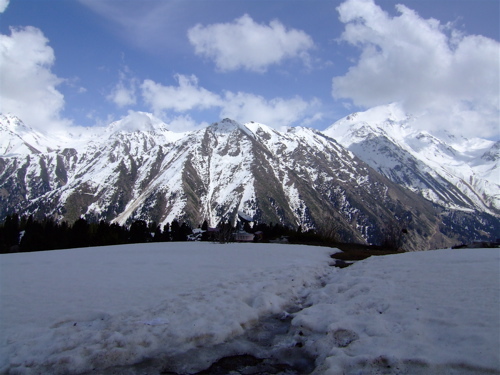 But being surrounded by the gorgeous mountains while listening to the lonely wail of the snowcock made for a perfect day. 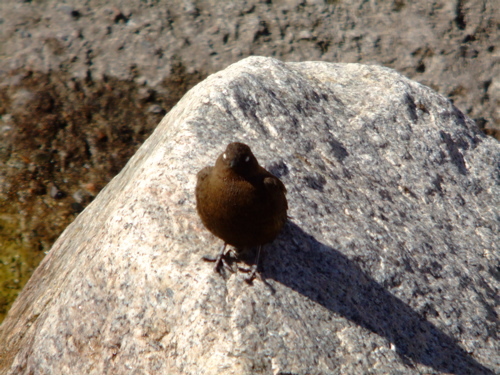 This is a brown dipper that we saw in Kazakhstan. Apart from being brown, it looked just like the American dipper we can see in the western US--right down to the white eyelids! 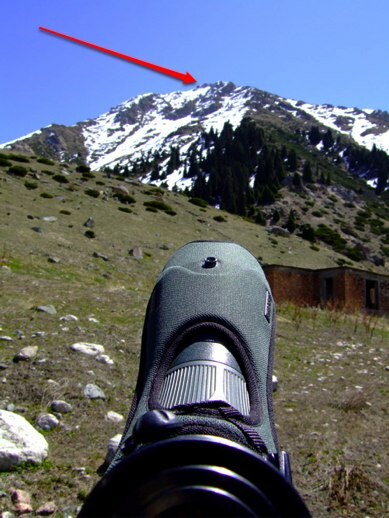 This was a bird in the Kazakhstan mountains. I like this video because I frequently tell people in bird programs that you can always tell a bird is about to take off because they poop right before they fly (to lighten the load). This mistle thrush does it perfectly. I found some phalarope photos that I had forgotten about. 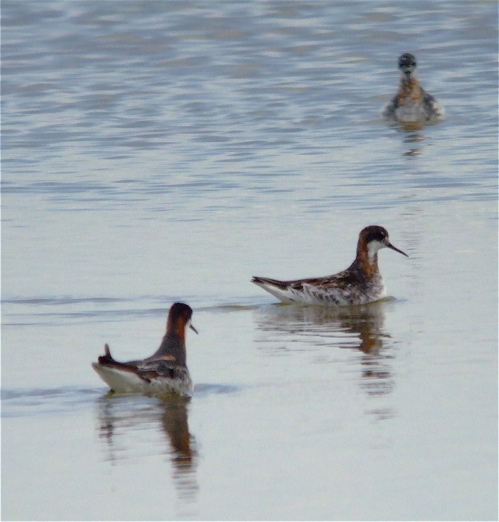 These are some red-necked phalaropes that we saw on the Steppes in Kazakhstan. When you are learning shorebirds, phalaropes are ones that can be easy to distinguish from the others, they have a unique shape, can be quite colorful and they are just plain fun to watch. They spin around in the water kicking up sediment and food below. No matter what country you are in, you can spot that spinning characteristic easily if they are around. 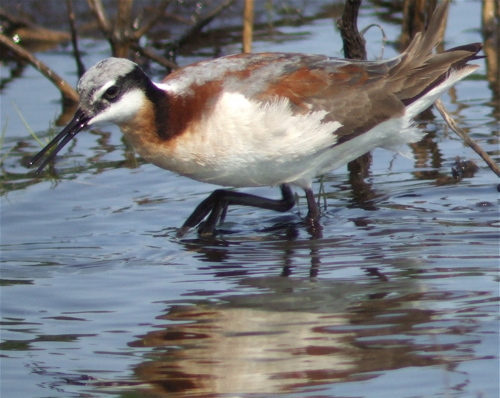 Plus, phalaropes are so pretty, look at that burgundy highlighted with delicate gray and white, touched off with some black. Above is a Wilson's phalarope seen in a pothole just outside of Arrowwood NWR in North Dakota during the Potholes and Prairie Bird Festival. That's a great thing about North Dakota, just driving to your destination will reveal great birds. We couldn't get into the NWR because of the flooding, so we just drove around it and in the puddles were birds. I was with my friend Katie and she would pull the van over while I sat in the back, opened the side door and digiscoped the phalaropes. Birds tend to not mind vehicles, just what comes out of a vehicle. 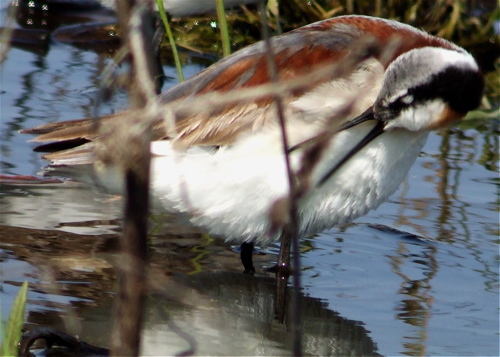 Here's a pair of Wilson's phalaropes preening. 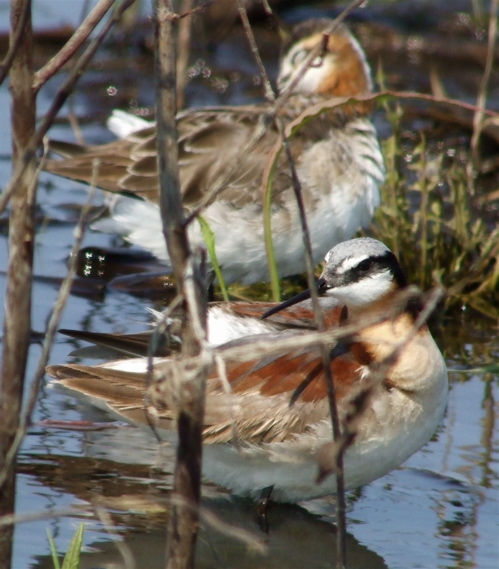 If you are not familiar with phalaropes, you might think that is the male in the front of the pair. It's not, that's the female. In phalarope world, you have a great term to use that you can impress your friends with at parties: reverse sexual dimorphism. The females are more colorful and they pursue the males. 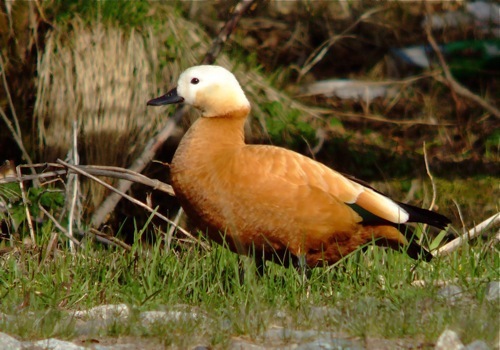 They defend a territory and once they have attracted a male and mated, she lays the eggs and heads south to get a head start on migration while the males stays behind to incubate the eggs and raise the young. Here's a shot of just the male, he is not colorful since he's going to be the one sitting in one spot to incubate the eggs. It's interesting that the female doesn't partake of any of the chick rearing duties. She doesn't bring food to the male while he incubates, she doesn't give him a break, nothing. It's wham, bam, thank you ma'am, she lays the eggs and then says, "See ya!" 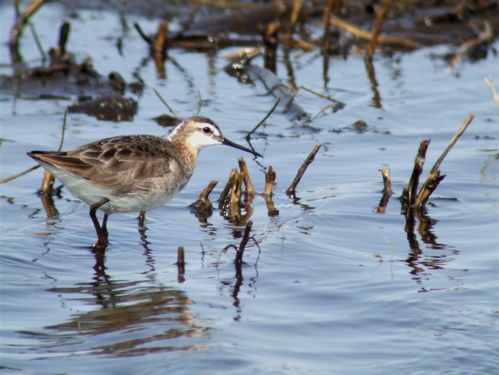 I wonder if female phalaropes ever get guilt for putting their migration before their offspring? 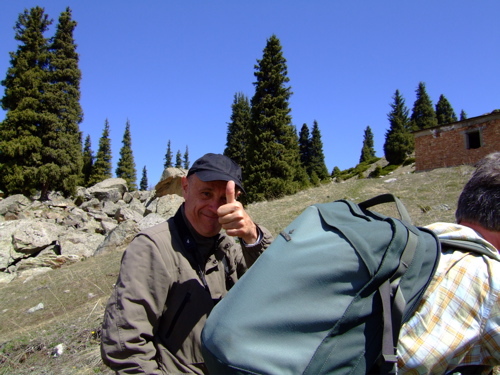 Now that spring migration has settled down a bit, I can talk more about Kazakhstan. I took out a group this weekend for some birding and one asked, "Why did you go to Kazakhstan?" There were several reasons, the biggest was that I have always wanted to go ever since I read about the country years ago. It sounded wild, remote and untamed. The other reason was a bird called the sociable lapwing (kind of a very snazzy killdeer--seen above). 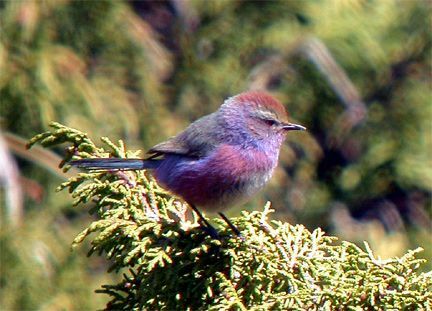 Swarovski Optik is a species champion of this bird through BirdLife International. 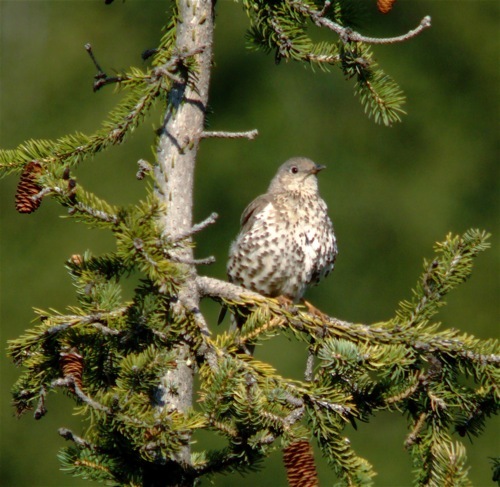 It's a bird population that has dramatically declined in recent years and is of great concern. 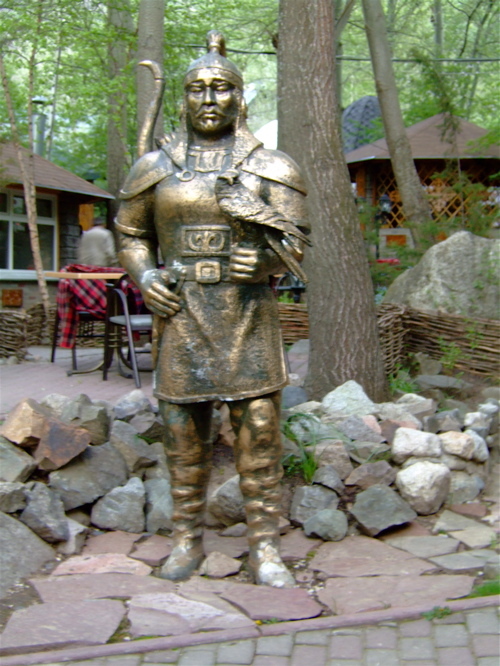 It's not certain what the original population was on the Steppes of Kazakhstan. 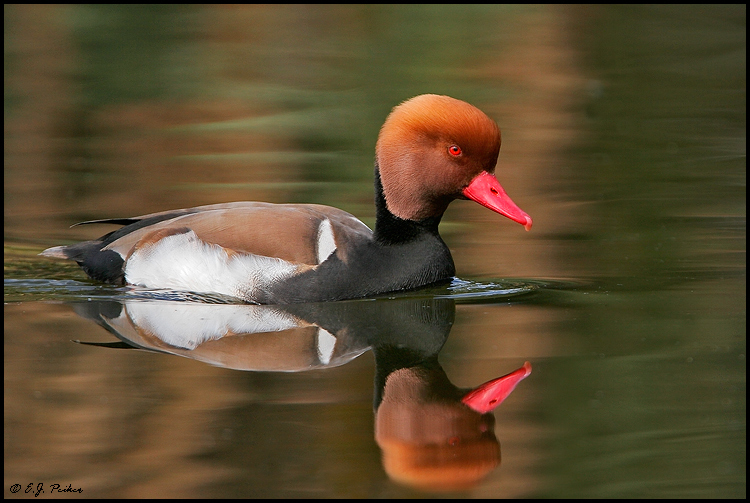 There was a count of 5,000 birds in 1990 and another count in 2002 put their numbers at 1200 in 2002. Current research suggests that the decline of the sociable lapwing is due in part to unevenly grazed habitat. Sociable lapwings used to live among ungulates known as saiga (do click on the photo of the saiga, that is one crazy looking ungulate). As the saiga declined, so did the sociable lapwing numbers. Incidentally, there were about 2 million saiga on the Kazakh Steppes in the 1950s, but a dramatic decline hit in the 1990s because of poaching--Saiga horn is used in traditional Chinese medicine as a fever cure. The lapwings apparently really liked the way the Saiga grazed the grasses to make watching for predators good for them when they are nesting. Swarovski and BirdLife International has made it possible for teams of locals to come out and monitor the lapwings, work with the locals to appreciate the birds and hopefully avoid the nests, and to work with cattle owners to graze in a way that mimics saiga grazing and is favorable for the lapwing. Note the young faces who are part of the Kazak research team, it's local people working with their birds and their communities, not a bunch of foreigners coming in and telling people how to manage their land. Swarovski is also coming out with a new digiscoping adaptor called the UCA. It's a bit more universal in the sense that many different cameras (even small video cameras) can be attached to the scope and it slides off easily. When we were taken to the sociable lapwing area, we were asked to test out the new adaptor. I have to admit, being on a trip of a lifetime and seeing unbelievable life birds, that last thing I wanted to do was learn a new adaptor for my camera and scope. But it was surprisingly easy to figure out. Now, the challenge became how to get twenty some odd birders close to skittish ground nesting bird when there isn't a lot of cover. I don't think we were all that sneaky behind that power pole. The researchers had us march in a single file line towards the lapwings, but the rightly suspicious birds just kept walking in the other direction. We had to be careful, because the females easily flush of the nest and the research team did not want to risk losing one valuable nest of this declining bird. We were getting great looks at the birds, but they were too far away to get great photos. Plus, heat shimmer was really starting to become a factor. The area behind the cow looks like a van Gogh painting. I even took a video and it looks like a raging forcefield is behind the cow. You'll note that a lone man walks behind the cow, apparently oblivious to the rare and sensitive birds nesting around him. That's part of the research team's job is to work with locals and let them know about these cool birds and hey, maybe don't walk right through their nesting territories right now. We went out in search of other birds around the Korgalzhyn State Natre Reserve with the adaptors and we were able to get some cool shots. 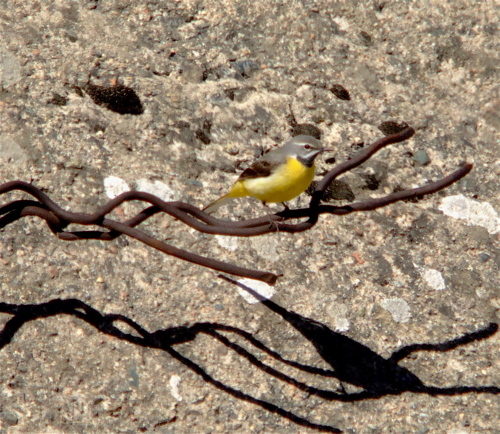 Above is a citrine wagtail--isn't that a fabulous little yellow bird and so accommodating to perch out in the open. I was even able to digiscope a warbler with the new adaptor--and those aren't easy. I have to say, warblers over in Europe and Asia aren't anything like our warblers here in the Americas. Above is a booted warbler and it pretty much looks like all the other Euro warblers: small, brown and fairly non-descript. Other warblers you can see over there are reed warbler, Hume's warbler, and Savi's warbler--brown, brown, brown. I'm used to prothonotary warbler and blue-winged warbler. I'll never complain about fall warblers in North America again. Even an orange-crowned warbler in the fall is more colorful than a booted warblers. While on the preserve, we also found a nice mudflat to check out for some waterfowl. Above is Corey from 10,000 Birds and Dale from Discovering Alpine Birds getting some shots of the ducks and shorebirds. Some of the species we saw included spotted redshank (gotta love a black shorebird), red-crested pochard, white-headed duck, and white-winged black tern. There were some familiar birds too. I heard gadwalls calling and I went to grab my cell phone (gadwall is one of my ringtones). Then I remembered that my phone didn't work in Kazakhstan and looked overhead. There were three gadwalls flying over--ah the familiar in a strange land! We also saw black-winged stilts and pied avocet (that's the avocet pictured above, distinctive with their long, upturned bill). 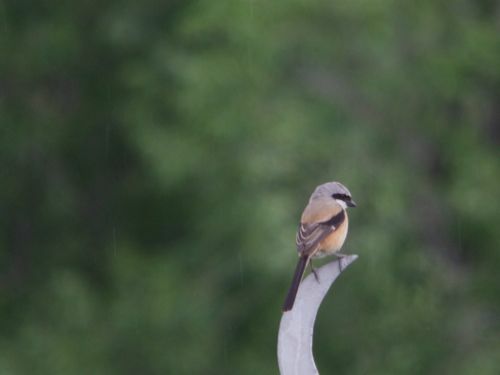 As we ended our time on the Kazakhstan Steppes, an Isabelline shrike popped up. I was surprised at the photos I got using the new adaptor that I had not worked with before in a place where I was unfamiliar with the birds. I don't think I will trade in my DCA for digiscoping with my Swarovski scope, but if my current camera craps out and the next one I get does not work with the DCA, I could see myself using a UCA. It's a bit larger, so doesn't fit in a pocket as neatly, but it is light in weight could be hooked around a finger. This post maybe TMI for some people. Take note of the title and if that is not your favorite subject or something you don't like imagine other people doing, I would recommend you stop reading and maybe check out this cool post by my buddy Amber about some gannet rescue she did while on vacation in Florida. When I travel, I'm periodically asked by friends to take along a stuffed animal or a Flat Stanley for photos. I almost always decline. Number one--suitcase space is an issue and number two--I always lose something when I travel, whether it be accidental or confiscated by airport staff. Stuff just goes missing. If I lost a friend's treasured critter that's been photographed all over the planet, I'd feel terrible. So, I got a request from an online rabbit name Audrey from All About You asking if I could take a stunt Audrey with me overseas. She has a blog and it would be a reciprocal blogging thing. I thought, "Okay, they have stunt rabbits, this isn't a treasured animal, I can do this." So, Audrey came with me and we had a lovely time in Frankfurt. Above she is hanging out with a rather large snail outside our Frankfurt hotel. We shared a beer in a Frankfurt bar (although, I had to chuckle at her choice of fruity beer--grapefruit beer? Really?). And then this is the last known photo of Audrey. After getting her photo next to a Frankfurt sign warning that you are being watched, she nestled into my checked luggage for our flight to Kazakhstan...and hasn't been seen since. And she wasn't the only thing missing from my checked luggage. I had also recently won a female urinary device known as GoGirl at an outdoor convention. I was anxious to try this out. But like Audrey, it was missing from my checked luggage. I don't know why, don't want to know why. And there were several times I missed my GoGirl. For example, above is one of our restroom stops. Our birding guide in Kazakhstan was more of an ornithologist than tour leader, so his bathroom breaks were stops like this with girls on one side boys on the other. I can go outdoors, but with short legs, there are some challenges, and I have a shy bladder. This was not ideal for me...I like a bush, a shrub for the illusion of privacy. Also, I like something to lean on or prop up against. If we did have restrooms, they were like this. Let's take a closer look. I really missed my GoGirl here. I was excited at this birding spot--if you look in the distance towards the center left, there's an old wall--a perfect spot for female privacy. I went around the wall, away from the birding group, I got in a good leaning position and started to go. All was running smoothly until a slight movement in my peripheral vision caught my attention. I looked and focused on the critter that was the same color as the wall and about to crawl on my exposed area...and that was the moment I got my lifer scorpion. Didn't know they had those in Kazakhstan. I lept up, there was spray, and a little tumbling. After a moment's recovery, I got my camera out for a photo. Apparently, my chosen leaning location was a little nook that the scorpion liked to crawl into. All I got was a photo of its tail. It was only about four inches long, but still freaked out this Midwestern girl. I also have a new appreciation for the quick dry material on REI's convertible pants. 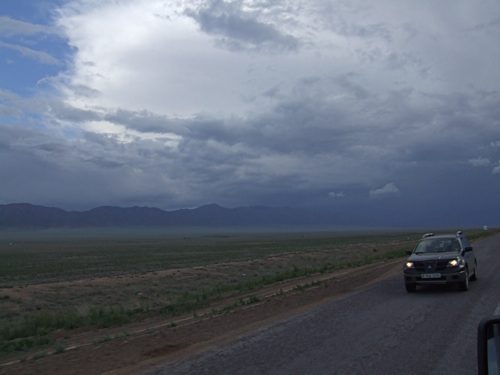 On our final day in Kazakhstan we hit a storm and it got very rainy. I asked our guide if we could stop some place for a toilet. He looked around and said, "This place is good," and pointed to the surrounding shrubbery. I said, "I really need someplace dry and maybe we could go to a gas station, I'll buy the vehicle some gas. A cafe? I'll buy some food, any place but I just want it dry." He looked skeptical but said he would find me some place dry. Our vehicle stopped and I didn't see any buildings, the terrain was as remote as the above photo. He pointed to a blue railing along the road and said, "See that blue pipe? That is bridge, you go under road, it be dry there." And it was dry and I appreciated it. So, Audrey and GoGirl, where ever you two are, I hope you are being put to good use. It's a bluethroat, these are actually possible to see in Alaska during the breeding season, then they head to Asia for the winter. 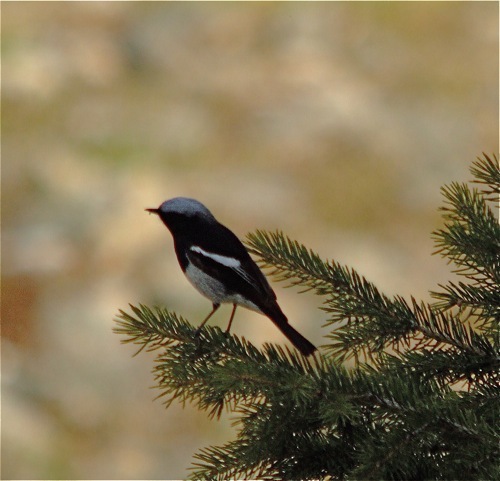 However, it is a common bird in Europe and Asia. I love it, in my neck of the woods I have a common yellowthroat in the reeds, over there, it's a bluethroat. Although, it's not a warbler, it's actually in the family turdidae...same as American robin. We birded our way through Korgalzhyn State Nature Reserve on our way to our evening accommodations. 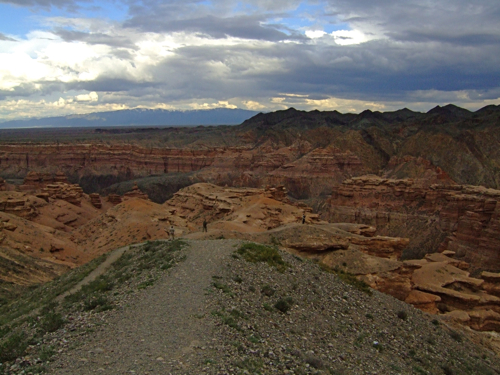 I hope you're not tired of the long range shots of Kazakhstan. Our information about the country said that there are fewer than six people per square mile...when you are out of the major cities, you could feel it. What a treat to be out in the middle of nowhere and at times not hear the sound of human or machinery. When we did encounter locals while we were birding, it was almost always Kazak cowboys--sometimes it was a joint effort of husband and wife and at other times, a lone cowboy on a horse with his trusty canine companion beside him. 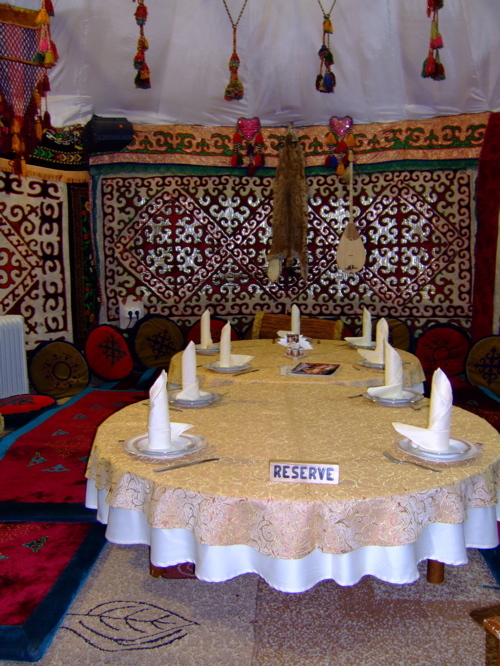 One of the items that was noticeable in my itinerary for Kazakhstan was the note that we would be going to Korgalzhyn State Nature Reserve and "small huts provide simple accommodation. We recommend a sleeping bag for this overnight stay." 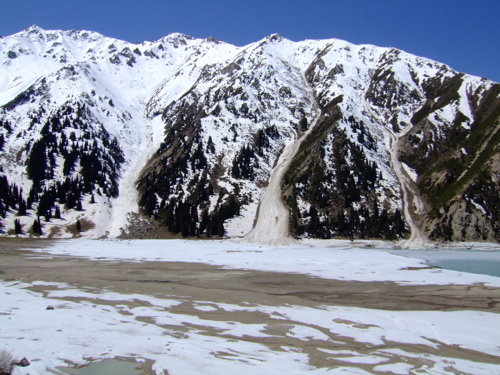 The photo included with the brochure showed the small huts surrounded by snow. I was fortunate that our visit was late enough in the spring that they snow had melted. The huts were indeed simple accommodations that included two beds, a night stand, and a tv (it barely got one channel and was intended for searching out severe weather reports)--the shower was outdoors and the toilet was an outhouse (more on using the adventures of going outdoors later). Before I left, I wondered how I could pack my sleeping bag--it's huge and easily takes up half a large suitcase. Fortunately, Mr. Neil (being a well experienced traveller) loaned me a tiny yet oh so warm silk sleeping bag. I was grateful for the toasty sleeping bag, the sleeping quarters were sparse and meant for researchers working the nature reserve and the extra warmth was much appreciated as the temps felt like they got down into the 40 degree Fahrenheit range. 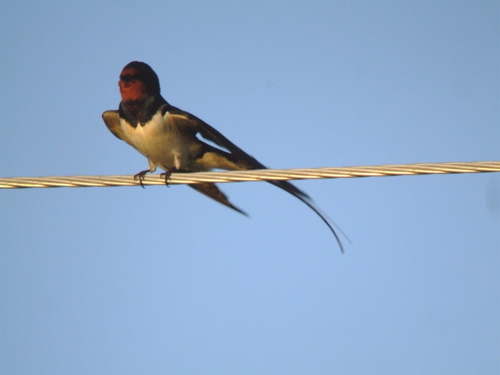 Check it out, one of the most common birds in the world--the barn swallow! I think even though this is the same species as the one I see in North American, it seemed to have a longer tail--must be a regional difference. 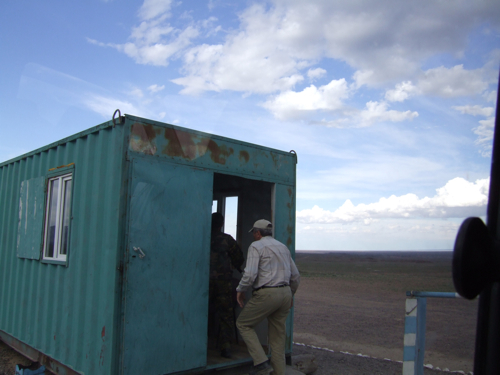 We had already done a full day's birding on our way to the research station with the huts. The plan was to spend the night, try out some new Swarovski equipment in the morning and then head off to see the sociable lapwing. It was a delight around the research station for anyone remotely into photography--we arrived last in the afternoon and the light was perfect. 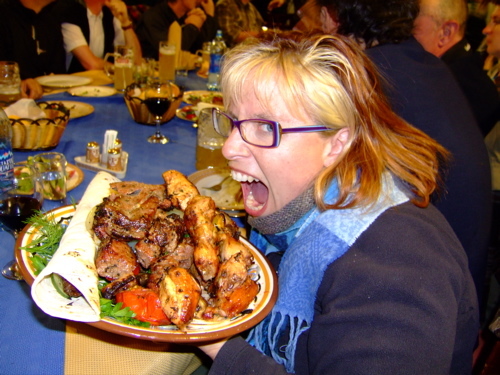 We were cut loose from the formal part of the tour and given time to explore the area while our evening meal was prepared for us. An excited group of birders at a remote research station, surrounded by new birds in perfect light while food and beer was being gathered for us when the sun went down--how could it not be more perfect than that? There were some bugs. None of my photos do the bugs justice. I even got a video of my buddy Clay walking up through the grass to kicking them up, but YouTube just does not have the quality to convey the quantity. Here's a link to a photo of a hatch of mayflies...this sort of conveys it. They didn't really bite, but every time we took a step in the grass, a swarm flew up and they just kind of floated and would hang near your hears, or accidentally get inhaled into your nose. Corey and I both remarked at how miserable our respective spouses would be having all these bugs all over the place. 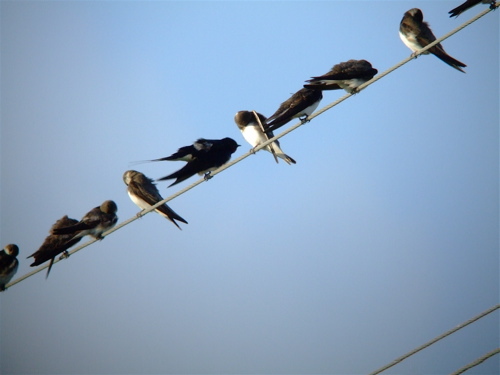 It also explained why there were so many swallows around the research station. But the birding was just grand! I think the above is now one of my all time favorite does. 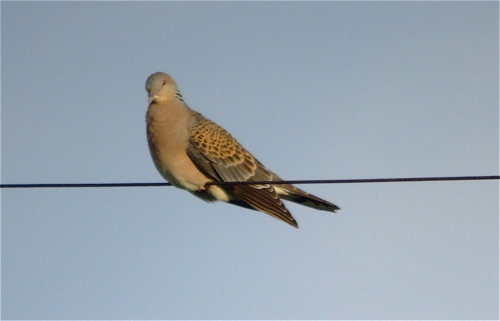 It's called an Oriental turtle dove and the coloration reminded me of a kestrel--heck the birds have pointed wings, so when flying they look very much like a kestrel. 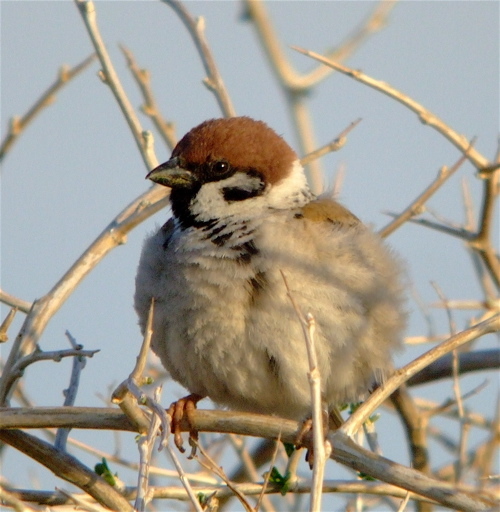 I was very excited to see one of these--this is a Eurasian tree sparrow. There's actually a small introduced population of these birds in St. Louis, MO. But it's more fun to see a bird in its natural habitat. 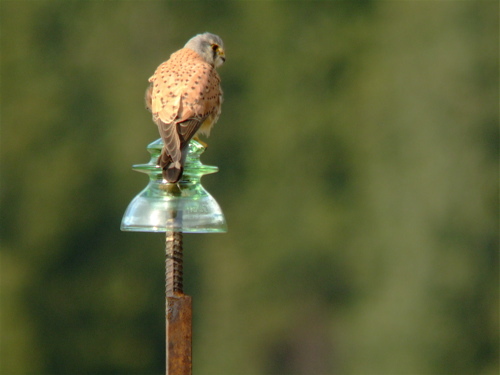 Quite a few hung around the research station, very similar in habit to the house sparrow. It was a merlin--just like the one's we see in Minnesota. Merlins can have different color variations, some are dark and some are light. 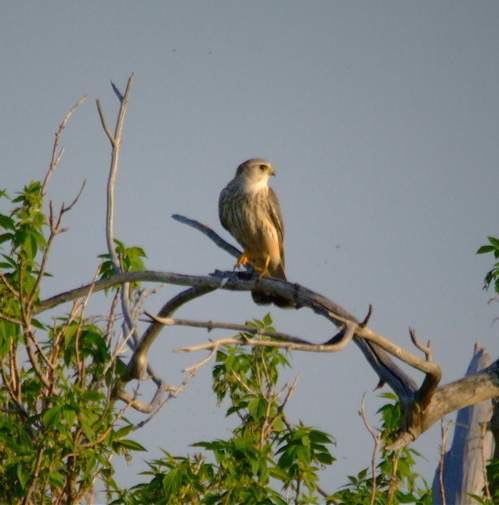 In the US, usually the prairie merlins are lighter in color. Well, here we were in the short-grass prairie area of the Steppes and this was hands down one of the lightest merlins I had ever seen in my life. Merlins are a falcon like a kestrel or a peregrine. One of the things that all falcons of the world have in common is a malar stripe. That stripe that goes vertically down under each eye. Click on the photo links to some falcons: peregrine, kestrel, hobby, lanner--note that they all have that stripe? Merlins have a lighter malar stripe in general, but this bird was so pale, he looked like he had no stripe at all. 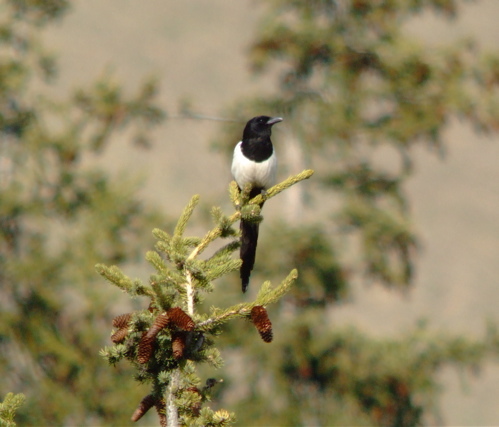 Speaking of familiar birds, we also saw several magpies. 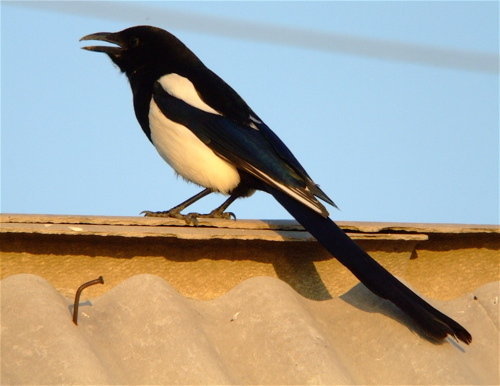 Here we call them black-billed magpies, there they are just magpies--both have the same latin name: Pica pica. Yes, I choose you. Quite a few of the birds were out and about eating the insects we were kicking up. 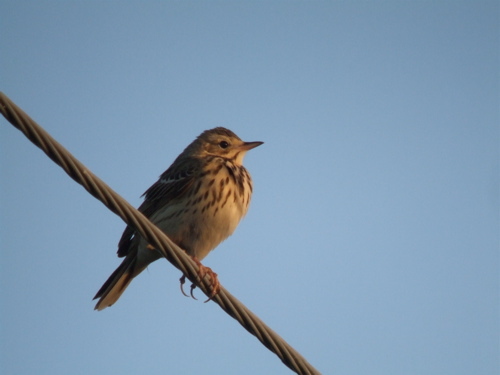 Above is a tree pipit that would fly off the wire and go for them. The spotted flycatcher was caught in the nets and banded (or ringed as they call it over there). As the light became too dim to photograph, all of us made our way back to the station for nourishment. I avoided tap water on this trip (and for those curious, I did not get any shots before I left, my tetnus was updated, and I opted to not get any of the Hepatitus or Typhiod vaccines). I stuck with bottled water, Fanta, beer, vodka, wine, and aquavit. Meals were interesting, you would get something like the rice and meat dish seen above and you would think, "OK, we're near China, this is going to have an Asian flavor to it." It did not, it was quite bland and refused to make any kind of flavor statement. It was good filling food, but not a taste sensation. I would say that the one constant with all our meals was tomatoes and cucumbers. Those were served with breakfast, lunch, and dinner. Often in the form of a salad with a light dill vinagerette or as in the case of our packed lunches--just raw. 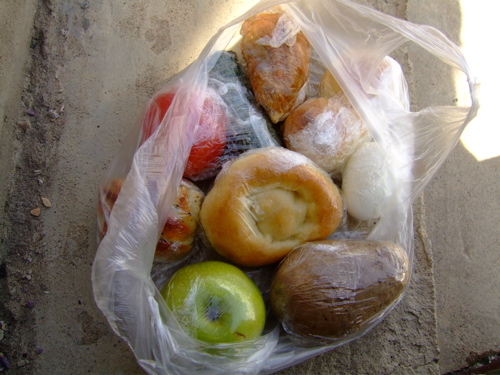 Bread was also a constant--we either had very dry crusty bread or a fried dough ball...kind of like a donut without the sugar. After dinner we sat around a bonfire with our box beer. The fire was no small feet--trees are few and far between on the Steppes, so it was made with wood from old crates or collapsing building near the station. A lovely way to end a day of amazing birding and it was exciting to know that more adventures awaited us.